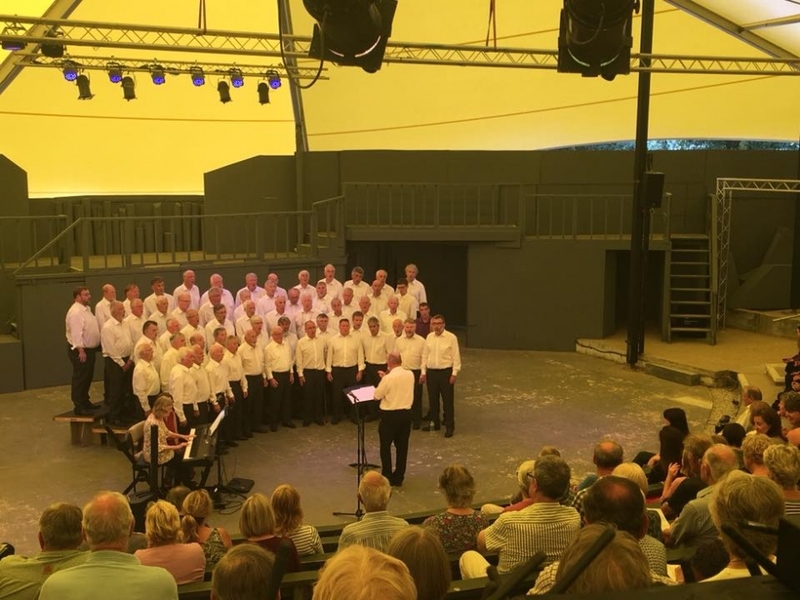 On a beautiful Summer’s afternoon the choir travelled to Liskeard to sing with Sterts choir at the theatre. With a very early start of 5:00pm an audience of over one hundred and fifty gathered to hear both choirs who were in fine voice. Under the theatre canopy the choir divested themselves not only of their jackets, but their ties as well! Unusually there was a break mid way through the concert so that refreshments could be taken which included a lot of ice cream. The choirs came together for the finale and performed ‘Anthem' from the musical Chess. The very appreciative audience gave both choirs a standing ovation. This was the second appearance for Mousehole singing with Sterts and by all accounts it won’t be the last. The choir were then treated to a very sumptuous banquet courtesy of our hosts and the singing continued until the coach left for home just before the setting sun. Our thanks go to Jane Warwick, musical director, and all of Sterts choir who made us very welcome and provided such wonderful hospitality. Now that July is upon us, the choir have commenced practice on Mondays and Fridays to prepare for our Summer Festival Concert on Sunday 5th August at St Mary’s Church Penzance when our special guest will be Faryl Smith. Our next concert is another first when the choir make the road trip to Penryn to appear at the Chapel on Thursday 12th July at 7:15pm.